Solution: The reaction between compound 1 and NaOCHMe2 in Me2CHOH as a solvent produces a mixture of two different products 2 and 3, containing a double bond, with a relative yield of 50% and 50% respectively. What are the structures of compounds 2 and 3?b. Which one of products 2 or 3 will be obtained as the major product if we do this reaction with MeO- +Na as the base in MeOH as solvent? Explain your answer with 1-2 sentencesc. Which one of products 2 or 3 will be obtained as the major product if we do this reaction with (CH3)3CO- +Na as the base in (CH3)3COH as solvent? Explain your answer with 1-2 sentencesd. Based on the data above, what products and in what relative ratios would we obtain by treating compound 4 with NaOCHMe2 in Me2CHOH as the solvent under the same conditions as above? Explain your answer with 1-2 sentences. The reaction between compound 1 and NaOCHMe2 in Me2CHOH as a solvent produces a mixture of two different products 2 and 3, containing a double bond, with a relative yield of 50% and 50% respectively. What are the structures of compounds 2 and 3? 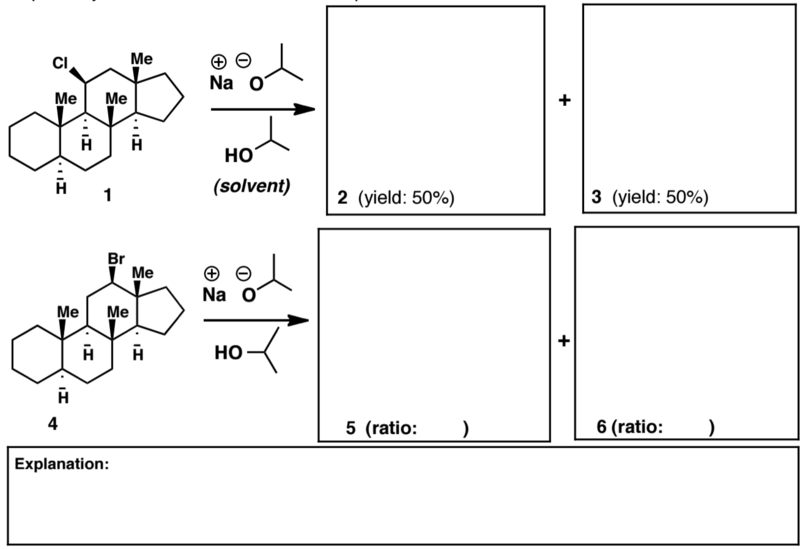 d. Based on the data above, what products and in what relative ratios would we obtain by treating compound 4 with NaOCHMe2 in Me2CHOH as the solvent under the same conditions as above? Explain your answer with 1-2 sentences. Draw the neutral organic products. Predict the product(s) for the following reaction.